A whole-department approach to whole-person development that is rooted in the 500 year-old tradition of Catholic Jesuit values. 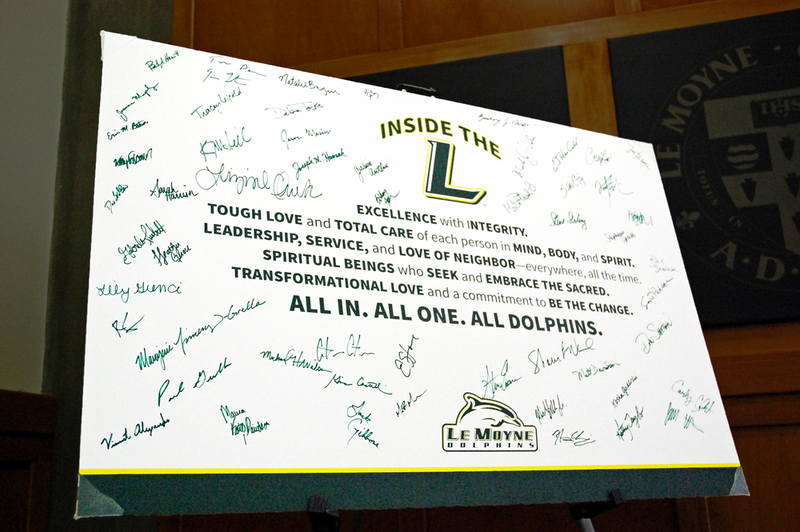 Want to know what makes the Le Moyne College Athletics experience unique, powerful and transformative? Click below to learn more about the 5 core values that lay the foundation of our shared culture. Each academic year, we embrace an annual theme that drives the educational content of our programming initiatives. Check out our 4 themes and what they are all about by clicking the button below. 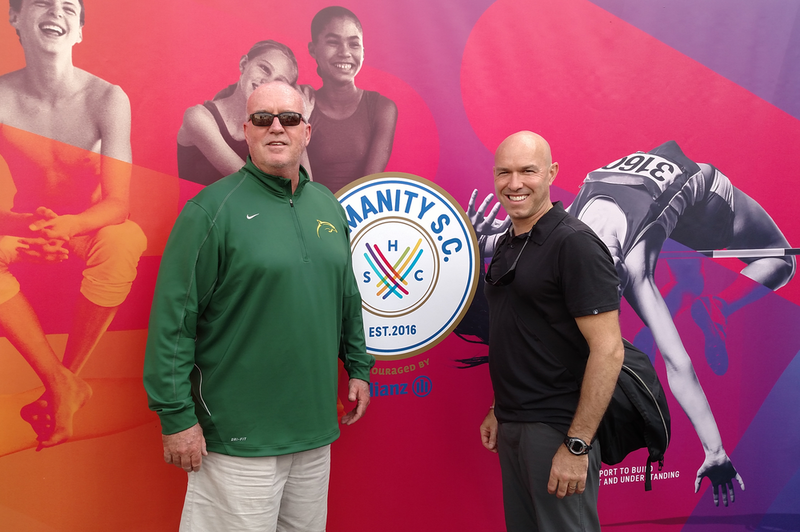 Le Moyne College Athletics was invited to attend the "Sport At the Service of Humanity" global conference at the Vatican followed by the regional conference at Villanova University. NOT A PROGRAM, A CULTURE. OUR WAY OF PROCEEDING. The work to create an even more deeply mission-driven athletic department began in 2011. Input was gathered from all stakeholders (administrators, coaches, faculty, student-athletes, parents, and alumni) to guide our quest to become a Nationally Premier Division II Athletic Department in the Jesuit Tradition. The resulting INSIDE THE L Touchstone represents a deeply intentional, shared and sustainable culture built on a 500 year old tradition of Catholic Jesuit values. INSIDE THE L is whole-department approach to whole-person development. Not a program, a culture; our shared way. Something we do with our student-athletes. Collectively we pursue excellence with integrity in the classroom, in competition and in life. Our intentional efforts to put our core values in action creates a unique formation and unique community that results in measureable educational and athletic success and whole-person development. ENGAGE HEAD, HEART AND HAND. INSIDE THE L programming provides a mix of strategies that engage head, heart and hand— for all department stakeholders. This includes opportunities for education and engagement for the whole department, by class (freshmen, sophomores, juniors, seniors) and within teams. In addition, programming opportunities include student-athlete retreats, leadership development and community service and engagement in our local and global community. Our social media presence contributes ongoing education, inspiration and engagement of the community. Learning, reflection and practical application are the hallmarks of our programming - which all department stakeholders experience. NEVER PERFECT, BUT ALWAYS STRIVING. INSIDE THE L is a journey to more intentionally put our vision and values into action. We define, measure and monitor the specific indicators and practices that we strive to live out. Individually and collectively, we know we will never be perfect. Never perfect, but always in pursuit of excellence with integrity. Optimal performance data is gathered using an ITL culture performance tool, which provides essential information for indicating trends, areas of strength and opportunities for continuous improvement. Our evidence tells us that as our culture grows in intentionality, our successes on and off the field also grow. THE QUESTION LINGERS... ARE YOU INSIDE THE L?